Bratton Picked to Lead NYPD, Wants "New Day"
Mayor-elect Bill de Blasio has chosen Bill Bratton, who served as NYPD commissioner under Rudy Giuliani, to lead the police department after campaigning on a promise to change police tactics and the department's relationship with New Yorkers. 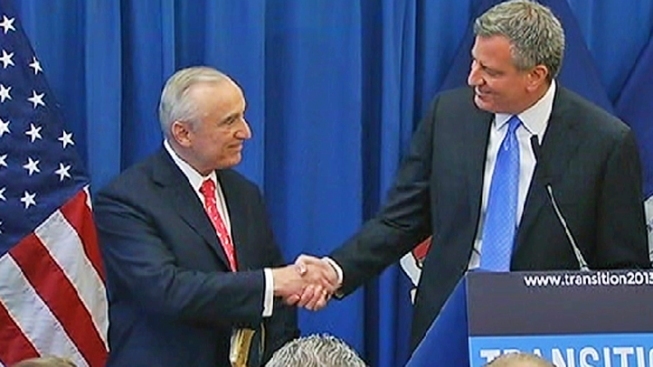 De Blasio and Bratton, who expanded stop and frisk at the LAPD, appeared together at a press conference in Brooklyn Thursday, promising that Bratton signaled a step toward a more community-friendly NYPD, not a turn to the past. "This is not deja vu all over again," Bratton said. "If we get it right, if we make the city safe, if we do it in a way that the public trusts us, then the benefits are extraordinary. If we get it right here, this is in many respects a beacon that can light the world." "I don't want to do it all over again the same way," he went on. "I want what he is promising -- a new day." Bill Bratton's police resume is hard to match: He's run police departments in three of the country's biggest cities and changed the way cops fight crime. Along the way -- and not by accident -- he also became a celebrity. Tom Llamas reports. Bratton first held the top NYPD post in 1994, and is credited with leading the development of CompStat, a crime-mapping database begun in New York City that has been copied by police in other cities. Crime dropped significantly during his tenure, but civilian complaints about police misconduct and brutality went up while he led the department. "There's been a consistent record of success," de Blasio said. Under Giuliani, Bratton was also remembered for his theatrics, including proposing a police parade on his birthday. He left the job for the private sector in 1996, creating his own law enforcement consulting business. Reaction to Bill de Blasio's appointment of Bill Bratton as police commissioner was swift, with emotions running high on the topic of stop and frisk. Andrew Siff reports. Bratton, a Vietnam veteran who began his career as a Boston police officer, served as chief of the LAPD from 2002 to 2009, where he dramatically expanded the use of stop and frisk. He said he supports it, when used properly. He said Thursday he wanted to fulfill de Blasio's dream of bringing the NYPD and New Yorkers "together in a collaboration where there is mutual respect and there is mutual trust." When Bratton led the LAPD, the department's use of stop and frisk expanded significantly. In 2002, cops made 587,200 stops, and by 2008, they made 875,204 stops, an increase of 49 percent, according to the Daily News, which cited a 2009 report from the Harvard Kennedy School. The majority of those stopped were black or Hispanic, the News said, but the number of stops that led to arrests was far higher than in New York. A federal judge ruled this summer that the NYPD violated the civil rights of tens of thousands of blacks and Hispanics by disproportionately stopping, questioning and frisking them; a small percentage led to arrests. The ruling is on hold pending an appeal by the city, which de Blasio has said he would drop. De Blasio said the city needs to "heal some of the wounds, reopen the communication." He said he wanted Bratton to "avoid focusing resources where they don't belong, which is on innocent, hardworking New Yorkers, particularly on our young men of color." "The idea here is to have real reform, to only use stop and frisk when it's constitutionally warranted and constitutionally applied, and to show communities that we are respecting law abiding citizens," de Blasio said. Bratton pledged he will "work very hard and will move very quickly to bring, once again, legitimacy and trust between the citizens of this city who feel that they don't have it, between them and this police department." City Councilman Charles Barron said that Bratton's appointment to the job was "unconscionable." "You don't ask the person who's the architect of racial profiling stop and frisk to come back now and put a stop to it," he said. Nicholas Heyward, whose 13-year-old son was shot and killed by police in a Brooklyn housing project in 1994, when Bratton was commissioner, said many in his community were angry that Bratton was back. "We, the parents who have been fighting for our loved ones and many others, are outraged," Heyward said. The NYCLU, which has been highly critical of the NYPD's use of stop and frisk, said in a statement that it looks forward to working with de Blasio and Bratton "to ensure that fundamental changes are made to the NYPD, including a top-to-bottom culture shift that ends racial profiling and the abuse of stop and frisk." The Rev. Al Sharpton, who clashed with Bratton during the Giuliani years, said in a statement that he had spoken with de Blasio about the choice to hire Bratton. Sharpton noted that his relationship with Bratton changed when the top cop was in Los Angeles; the two worked together on gang violence and police misconduct issues, he said. "I told Mayor-elect Bill de Blasio and Commissioner Bill Bratton that I hope they will work with a broad cross-sector of New Yorkers ... and we discussed meeting over the next few days to discuss these matters with him and with other civil rights and community leaders," Sharpton said. De Blasio said he made his decision only in the last few days. He interviewed three candidates for the job. Bratton takes over a department led for 12 years by Ray Kelly, who oversaw a historic drop in crime.